One of the less explored valleys in the Garhwal Himalayas, which is adjacent to the revered Ganga Valley and is known for its virgin meadows and full of wild flowers and showcasing beautiful views of not only the Bugyals, but also the peaks that stand as sentinels, along this beautiful trek.The Bamsaru Khal trek provides an opportunity to explore the Asi Ganga valley, and the upper reaches of river Hanuman Ganga all the way to Chayya Gidara valley. 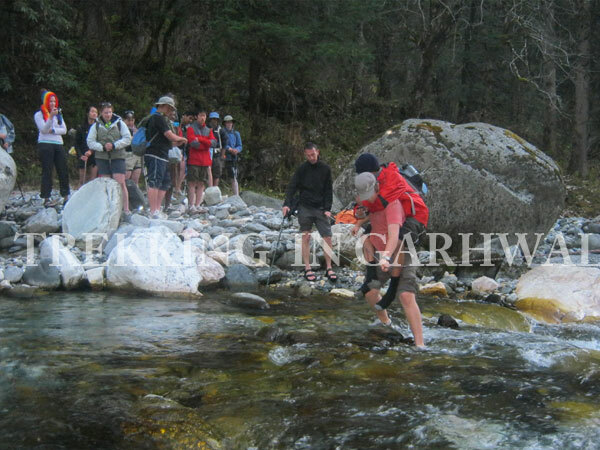 This route is considered as the old traditional conjunction between Yamunotri and Gangotri. On arrival at Delhi airport meet with our representative and transfer to hotel for overnight stay. From here it is a drive of 45 minutes that gets one to Rishikesh by road, In the evening visit the Ganga river bank for the spectacular and moving Aarti- spectacle of sights, sounds and chanting.. Rishikesh is well known for its scenic beauty and the spiritual experience. Flanked by the Shivalik range of the Himalayas. It is fabled that when Raibhya Rishi penance hard, God appeared by the name of "Hrishikesh" and this area thereafter came to be known as Rishikesh (Locks of the sage). Overnight in hotel. A drive takes one to Uttarkashi along the narrow Ganga and Bhagirathi valleys. The road goes past the sacred confluence of The Alaknanda and Bhagirathi rivers at Devprayag where there is a Lord Rama temple called the Raghunath Mandir visited by the great Hindu philosopher - Adi Shankaracharya in 300CE .This town is the home of the late Acharya Shri Pt. Chakradhar Joshi (a scholar in Astronomy and Astrology) who established Nakshatra Vedh Shala (an observatory) in the year 1946. This is located on a mountain called Dashrathanchal at Devprayag. The observatory is well equipped with two telescopes and many books to support research in astronomy. It also contains about 3000 manuscripts from 1677 AD onwards collected from various parts of country. Uttarkashi is a town located in the wide Bhagirati valley, and has been a centre for learning and religion since the days of the Vedas! This sacred town has been home to some very famous sages and saints. The name of the town reflects its similarity to and location (as north of) the city of Kashi (Varanasi). Similar to Varanasi, town of Uttarkashi lies next to a hill named Varunavrat Parvat, and set on the banks of river Bhagirathi at an altitude of 1158 metres, about 145 kms from Rishikesh on the main route to Gangotri. The famous Vishwanath temple here is dedicated to Lord Shiva. In front of the temple is unique Mahadev-ka-Vishal Trishul or Shiva's Great Trident, made of eight major metals (Astadhatu). It is believed Lord Shiva killed Vakasur with this trident. Other important temples are dedicated to Lord Parashuram, Lord Ekadash Rudra and Goddess Kali. It is an important stopover for pilgrims visiting Gangotri. Uttarkashi has also emerged as an important centre for adventure sports.. Overnight in hotel. Set out to Sangam Chatti after breakfast (14 kilometers) on a half an hour drive. This is the starting point of the trek. From Sangam Chatti the trail is well marked and climbs to the true right of the valley and continues to the village of Agoda. From this point it is a 2 kilometer trek to the settlement at Bhebra - an idellic village set near a gushing mountain stream, and full of green fields growing potatoes, beans and the famous Rajma. Since this is the first day of the trek, and aching muscles need to be rested in preparation for the steep climb the next day. Overnight in tents. The day is reserved for rest, relaxation, and exploration near this beautiful crystal clear . lake situated at a height of 3,024 metres (9,921 ft )The trees around the lake add to its charm, as the mixed Oak and Rhododendron forest assumes amazing colours depending on the time of the year, and the quiet surroundings of the lake presents an ideal location for meditation! The lake is surrounded on three sides by forests and steep mountain sides, with an opening towards the Asiganga valley, with a magnificent view of the Dayara Bugyal area, across the valley. According to one of the popular legends Lord Ganesha chose this place as his abode. There is also a temple devoted to Lord Ganesha here. 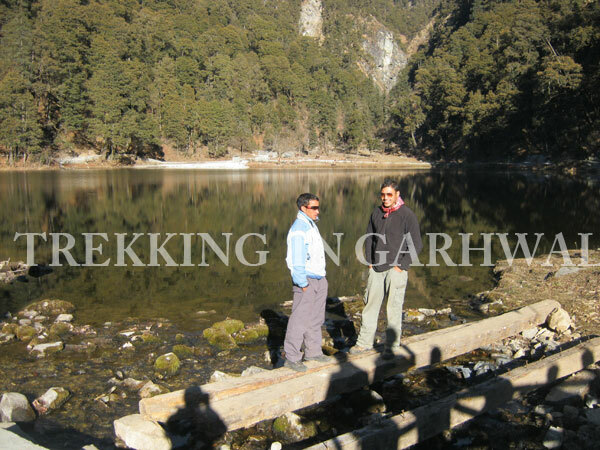 Another name for this lake is 'Dhundital' meaning Ganesh ka Tal or lake of Lord Ganesha. Legend has it that this was the lake where Goddess Parvati used to bathe, and Ganesha was beheaded by Lord Shiva in a fit of anger! The trail from Dodital ascends steeply on the other side of the lake along the feeding stream crossing it several time on the way up. The trail zig zags initially through the forest and later leads to the open meadows. The final push towards the pass becomes more arduous and the effects of the high altitude are clearly felt as one has to pause time and again to catch his/ her breath. 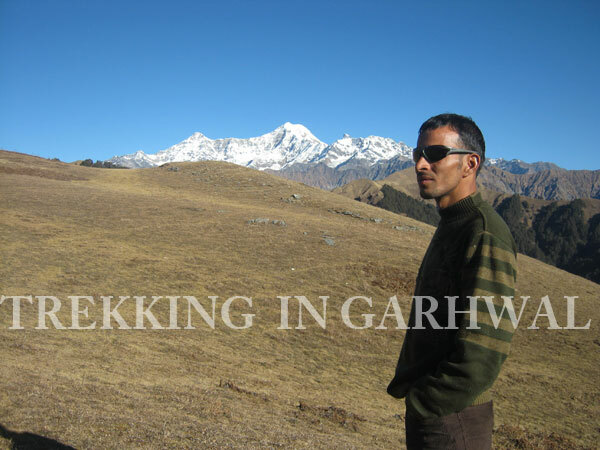 At ( 4115 m ) Darwa Dhar Ridge serves as the the watershed of the Asi Ganga and Yamuna River valleys. The arrival at the pass is rewarded with stunning views of the mighty snow clad mountains such as Bandarpunch and Gangotri group. From this point, one path goes to the Yamuna valley and terminates at the road head at Hanuman Chatti, and another, that takes one on the path towards Bimsarukhal via Bingad . The unmarked trail goes over the breathtaking meadow, with occasional glimpses of the Gaddi people (shepherds) in their makeshift tents and also village cow herds with their animals. On arrival camp near Bingad. Overnight in tents. The trail continues in beautiful Bingad valley exploring our day towards Deodamini, a higher meadow closer to main summit of Bandarpunch. After exploring Deodamini return to the base camp at Kanatal. Overnight in the tents. From Kanatal the trail ascends steeply towards Bamsaru Khal (4600m). From here the great range of Gangotri group of peaks can be viewed in detail. Now the trail descends steeply towards the base of Bamsaru Khal. The campsite is by the stream. Overnight in the tents. 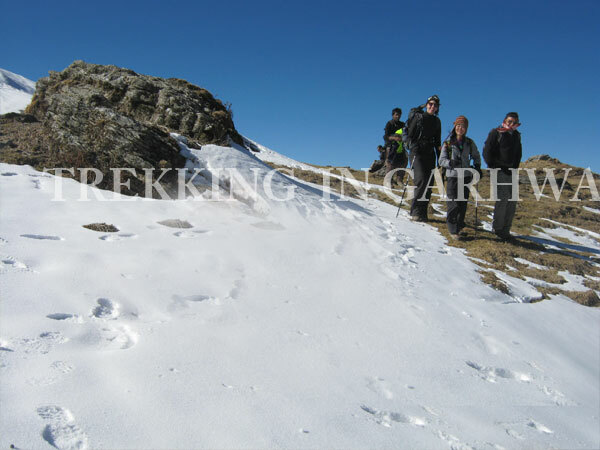 This day the trail ascends to a ridge top called Chupkantidhar ( 2832 m ). The trail descends from here to Songad a major stream that emerges from Chhaian bamak (Glacier). With the angle changed, yet another profiles of Banderpoonch and Kalanag Peaks can be viewed from here. Camp by the stream and overnight stay. The day's final ascend on the outer ridge of Bandarpunch massif (2745 m) takes one on a continuous descent to Bhagirathi valley. From the ridge the route continues to Sukhi village which is the road head. From Sukhi a drive of 15km ends at the beautiful village of Harsil , famous for its beautiful houses and the world famous "Wilson Apples". Check into hotel. Explore the surroundings as the village is located on the Evening at leisure. Overnight in the hotel. From Harsil along drive to Rishikesh via Uttarkashi ends late in the evening. On arrival check into the hotel The Ganga Aarti is worth visiting on the banks of the Ganga . Overnight in the hotel. Transfer to Haridwar railway station to board Ac train for Delhi. In Delhi meet our representative and drive to the hotel. Check into the hotel and overnight stay.